A total lunar eclipse wowed skywatchers over the weekend, but for some keen-eyed observers, Sunday's "blood moon" came with an extra special treat: the first known sighting of a meteorite smashing into the moon during a lunar eclipse. The eclipse, which occurred overnight on Jan. 20-21, was streamed live online by several organizations, including the Griffith Observatory in Los Angeles and the Virtual Telescope Project. During the broadcast, at around 11:41 p.m. ET, some viewers noticed a brief flash of light in the top left quadrant of the moon. 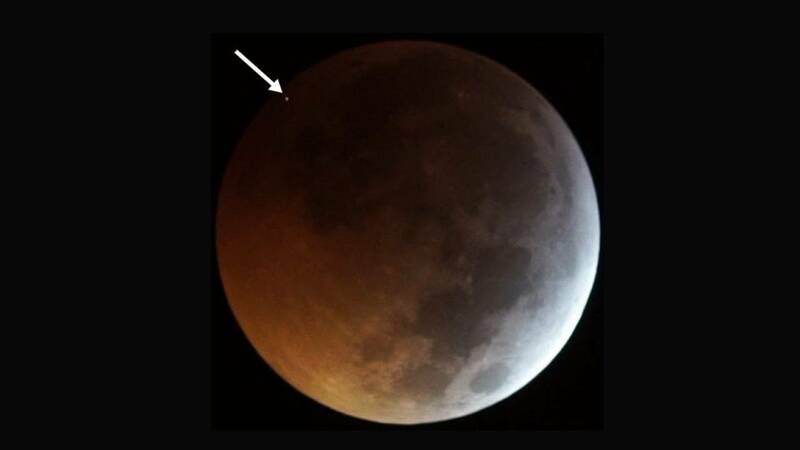 Jose Madiedo, an astronomer at the University of Huelva in Spain, says the glint was caused by a meteorite that slammed into the lunar surface right as the moon became completely engulfed in Earth's shadow — a phase during an eclipse that is known as totality. "This is the first time in the history of astronomy that a lunar impact flash [was] recorded during a lunar eclipse," Madiedo told NBC News MACH in an email. Several eagle-eyed observers also noticed the flash, with one Reddit user on Monday posting screengrabs of the incident from three different online broadcasts. Madiedo said he was careful to rule out other explanations for the speck of light that can cause "false positives," including glare from satellites or high-energy radiation in space that can trip up telescope sensors. The astronomers consulted data from the MIDAS (short for Moon Impacts Detection and Analysis System) project, which gathers observations from telescopes at three different observatories in Spain. MIDAS was able to confirm the flash and its precise location on the moon from each of the three observatories, Madiedo said, adding that he has tried to capture this rare phenomenon for years without any success. During previous lunar eclipses, Madiedo and his colleagues used four telescopes to observe the moon from their observatory in Seville, but for this weekend's eclipse, he said the team undertook a "huge effort" to set up eight telescopes instead. "I was very surprised when the software that scans the images to locate these events notified me that we had an impact," he said. "But I was also really happy and excited to see that, at the end, the effort was rewarded." It's not yet known what caused the impact, but Madiedo said that by studying these flashes, astronomers can refine their statistics on how often the moon is pelted with space rocks and other cosmic objects. And though it may be surprising to see an object strike the moon during a lunar eclipse, it's not uncommon for the moon to get whacked. According to Randy Korotev, a lunar geochemist at Washington University in St. Louis, these impacts happen a lot on the moon. "I'm not at all surprised that they may have seen an impact," Korotev said in an email. "The moon gets hit every day."